It was farewell to Tom Boonen this year – he announced that Paris-Roubaix would be his last professional race, no matter what the outcome was. Many of us longed for one more Ronde-Roubaix double out of the greatest classics rider ever but it was not to be. During the Tour of Flanders, he suffered a mechanical on the Taaienberg – aka Boonenberg – of all places and finished the day 37th, although he was key to teammate Philippe Gilbert‘s win. Then on to Roubaix, where the race never really took off for the Belgian legend, and he crossed the Velodrome finish line sixth overall. He might not have had the fairytale ending, but he went out the way he always raced – with pure class. You have to have a heart for Edvald Boasson Hagen, who was on the wrong side of two photo finishes in the Tour de France before finally winning stage 19 solo, and lost out on photo finishes on stage 1 and 3 of the Tour of Britain before winning the final stage in Cardiff and finishing second overall. Peter Sagan was involved in two photo finishes in two of the biggest races of the year – Milan-San Remo, in which he placed second, and the Worlds, in which he pipped Alexander Kristoff to his third consecutive rainbow jersey. From the Spring of PhilGil (see G) to the storming of the Grand Tours, Quick-Step were hands-down my team of the year with 56 wins this season – including 16 – SIXTEEN – Grand Tour stages (10 more than their closest rivals)! In the Giro, Fernando Gaviria took 4 victories, wore the maglia rosa for one stage and took overall points jersey; Jungels BOB JUNGELS took a stage win, wore the maglia rosa for 5 stages and took overall best young rider jersey on the last day with a storming time trial. In the Tour de France, Marcel Kittel won five stages and wore green for 12 stages before having to abandon due to sickness. And in the Vuelta, Yves Lampaert took one stage (and wore the red jersey for one stage), Julian Alaphilippe won one stage and Matteo Trentin took four, including the final stage in Madrid. Both Gaviria and Kittel had 14 victories this season – sharing the top of the leader board for most wins. Not only did Tom Boonen and Alberto Contador hang up their professional wheels this year, but so did the Man of a Thousand Faces, Thomas Voeckler. While he didn’t post up any victories or notable positions in 2017, he was very much there in his 15th consecutive Tour de France – the race that really made his name in 2004 when, as a young pup, he wore the yellow jersey (and fought hard the whole way) for 9 days – so it was fitting that the organisers would honour him in Paris to mark his last professional race. Another rider who retired this year was Manuel Quinziato – a firm favourite here at VeloVoices Towers. Having finished his masters degree in law earlier in the year, he rode his final Giro d’Italia stage in the Italian national TT champion’s skinsuit. But why Quinziato is under S for Sacrifice is because his last professional race was supposed to be the team time trial at the Worlds in Bergen. However, at the last minute, he bowed out, giving his place to Tejay van Garderen. ‘I’m not at 100 per cent. I wouldn’t have forgiven myself if I’d stopped the team from having the best line-up,’ he said. A fine rider – an even finer man. Chapeau. The first rider to win three consecutive rainbow jerseys, the first to win them on three different continents. And we never saw him in the race until the last hundred metres or so. Yes it has to be the Velvet Samurai, Peter Sagan, taking his third World Championship in a photo finish with Alexander Kristoff. In what could be classified as a disappointing season, what with being DQed from the Tour de France for irregular racing (a decision since overturned) losing the chance to win his sixth green jersey, Sagan did rack up his 100th career WT victory with a win at GP Quebec, posted up some eye-watering flex tweets and baked and crafted his heart out. But probably most important to him, he became a father when his wife Katerina gave birth to their first child, Marlon. Stage 9 of the Tour de France was one of the most eventful – in mostly a bad way – of Grand Tour stages this year. The crash that took out Richie Porte and (ultimately) Geraint Thomas, as well as hampering Dan Martin‘s chances (see C for Crashes). And a stage of heartbreak of a different kind. The stage was won, so he thought, by Warren Barguil in a photo finish and he was sitting down to his post-stage interviews when the news came that, no, upon reflection, it was in fact Rigoberto Uran who won. And he won it riding in just one giant gear. He went on to finish second overall. It was the strange case of Cannondale-Drapac losing about $7m worth of funding due to a sponsor pulling out at the last minute. 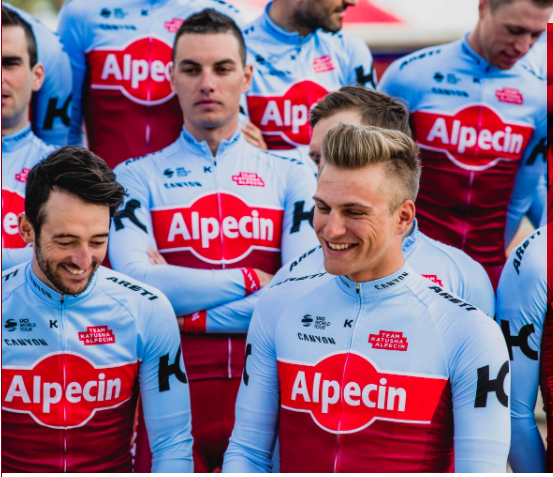 The trouble was announced at the end of August: all riders and staff were released from their 2018 contracts (many of whom had just signed them …), there was a hue and cry throughout the cycling world and there was a crowdfunding initiative started. Some riders went with new teams, while others decided to hold on, including Rigoberto Uran. 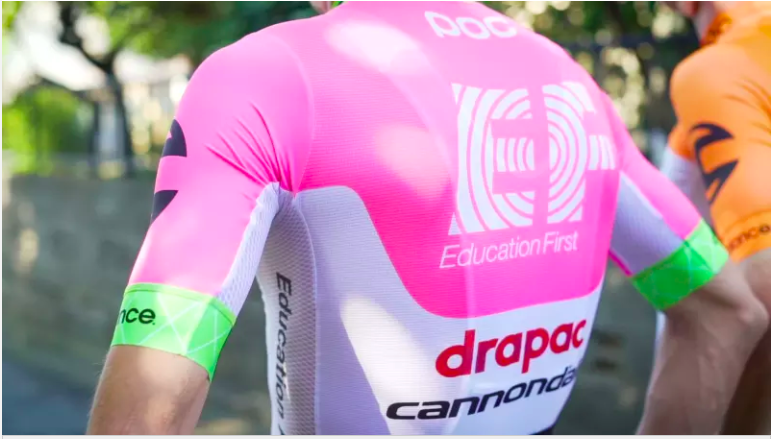 Amid the chaos, a new sponsor stepped up and the team is now EF Education First-Drapac p/b Cannondale. Really trips off the tongue doesn’t it … but the kit is kind of fun (although I wonder how they’re going to get that pink past the Giro organisers). Yes, the X is always problematic in these things, so poetic licence is used. Riders have swapped around so we’ll all have the fun of trying to remember who’s gone where. Here are just a few of the 2018 transfers: Marcel Kittel to Katusha, along with Ian Boswell and Alex Dowsett; Alexander Kristoff, Dan Martin and Fabio Aru to UAE Emirates; Simon Gerrans to BMC (I’ve only put him in because, really, is he still riding??? ); Quick-Step are losing Gianluca Brambilla to Trek and Matteo Trentin to Mitchelton-Scott (formerly Orica-Scott, formerly GreenEdge & Ham) but gets Elia Viviani. And of course Mikel Landa to Movistar (see L). For a full list of transfers, go to the great Pro-Cycling Stats. This year’s Tour de France had only three riders in the yellow jersey: Geraint Thomas, Fabio Aru and Chris Froome who had the lion’s share of days in yellow. This moves Froome up to fourth on the list of most yellow jerseys with 59. Miguel Indurain is 3rd with 60; Bernard Hinault 2nd with 75 and Eddie Merckx is way out ahead with 96. With all the excitement of Alberto Contador‘s last Grand Tour as well as the frustratingly crushing Skytrain dominating the Vuelta, it’s easy to forget that Ilnur Zakarin rode a stealth race to finish on the third step of the podium in Madrid. With Marcel Kittel joining the team for sprint success, Tony Martin talking about tackling the Spring Classics, it looks like the Russian rider is Katusha’s Grand Tour rider for 2018. That’s not a bad shout, considering that in addition to his Vuelta podium, he also placed fifth in Giro 2017. It’s already been announced that he’ll be Katusha’s man for the Tour de France next season, hoping to add to his 2016 stage win with a possible podium. He might look like Shaggy from Scooby-Doo but his riding is anything but schleppy. It was in April of 2017 when Michele Scarponi was tragically killed during a training ride near his home in Italy. I didn’t put that in this look back on the season as I felt it was too big and too serious to put in a tongue-in-cheek season round-up. We will be doing a special post next week on those riders we lost this year, one that hopefully hits the right notes of sadness at their passing and celebrations of their lives. Next PostVeloVoices Awards 2017 : All the results!